This article is a short summary of Mario & Sonic at the Sochi 2014 Olympic Winter Games. Mario & Sonic at the Sochi 2014 Olympic Winter Games is the fourth installment in the Mario & Sonic crossover series, released exclusively on Wii U in late 2013. 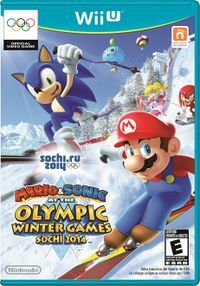 The game is based around the 2014 Winter Olympics in Sochi, Russia, and is the second game in an exclusivity deal between Nintendo and Sega, in which Sega released three Sonic the Hedgehog titles exclusively for Nintendo consoles, following Sonic Lost World and preceding Sonic Boom: Rise of Lyric and Sonic Boom: Shattered Crystal. This is the first installment in the series to be developed for only one console. Mario & Sonic at the Sochi 2014 Olympic Winter Games allows players to compete as Super Mario and Sonic the Hedgehog characters in events based on the Winter Olympics, either realistic or in more fantastical Dream Events that takes place in locations from the worlds of Mario and Sonic. Players can either compete locally or, with select events and in a first for the series, online. Also available are a variety of other modes, including Legends Showdown, in which players must defeat an assortment of opponents in succession to win the grand prize trophy; Medley Mania, in which players play through a series of events with a common theme; and Action & Answer Tour, in which players are asked questions and must find the answer by competing in the event while also trying to win. This page was last edited on 13 August 2017, at 20:39.